What a blessing it is to be able to look back on a year and see how far we each have come. And as 2012 ends and 2013 commences, I am picking a word to center my 2013 (for 2012 it was Kairos): After spending a year trying daily to focus on God's time and timing has allowed me to grow a faith that I am grateful for. And in this practice of finding God's time (Kairos) I have grown. 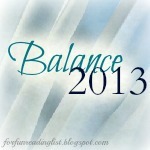 So for 2013 I'm focusing on Balance - life can be so hectic and crazy and focus can easily be lost. I want to make sure that I am daily try to keep a balance on all that I want to accomplish. My hope is that through striving to keep somewhat of a balance will allow me to focus my day on His work, and less on my personal wants. I am grateful that this community has allowed me to step back for the last few days over the holidays as I focused on my family and getting re-energized about what the new year holds. This blog has given me the a chance to share my life in hopes that others will be encouraged and feel community. I love books for allowing us as people to find common ground to discuss and use a starting point for conversation. I have pushed myself to stay true to my desire to find time to read (not an easy task for mamas) and I have committed myself to squaring time out for my King daily (again not an easy task for mamas today). Both have been a blessing. I am going to continue with this platform in the same general way in the foreseeable future - as I do feel the need for a place to discuss books with godly women is important in today's world. I will be adding a few more personal posts though, as I feel it is important to share with others, in an attempt to show we are not alone in this world. I hope that these more personal posts will resonate with your hearts and you will chime in with your feelings, as I love hearing from all of you. There will be some minor changes to the Cozy Book Hop, as I'm planning to do my children's literature reviews separately and use the hop days to share some of my favorites from the week. So please plan on joining in on the fun on Thursdays! 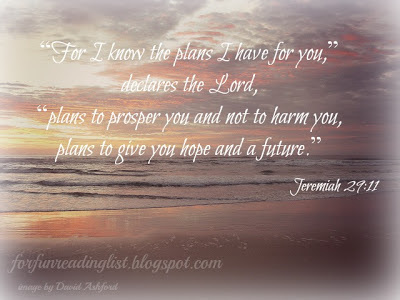 Here's to a new year, I pray yours is filled with answered prayer and hope for the wonderful future He has promised for you and is working diligently on.